Description: This Shivastalam is considered to be one of the holiest shrines in India. It represents the southernmost of the 12 Jyotirlingams of India and has been a time honored pilgirmage center held on par with Banaras. The island-temple town is located off of the Sethu coast of Tamilnadu (south eastern). This shrine is regarded as the 8th of the Tevara Stalams in the Pandya region of Tamilnadu. This temple is assocated closely with the Ramayana and Rama's victorious return from Sri Lanka. Rameswaram is an interesting temple both from the standpoint of its association with Rama and from a structural standpoint. A. huge temple in the island of Rameswaram (reached via the Pamban bridge across the sea), Rameswaram is known for its long ornate corridors and towers and 36 theerthams. Legend has it that Rama worshipped Shiva in the form of a Shiva Lingam made of earth by Sita, while returning to Ayodhya. Legend has it that Hanuman was entrusted with the task of bringing an image of Viswanathar from Benares. Anticipating delay in Hanuman's return from Benares, Rama is said to have offered worship at a pre-chosen auspicious moment to a Shivalingam fashioned out of earth by Sita. This lingam is referred to as Ramalingam and the town is known as Rameswaram. There is yet another Shivalingam here - Viswanathar said to have been brought by Hanuman from Banares. This Shivalingam is referred to as Kasilingam and Hanumalingam. 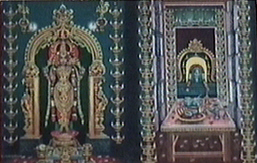 Prayers are offered to Viswanathar before they are offered to Ramanathaswamy. Legend has it that Rama worshipped Tilakeswarar at Devipatnam nearby enroute to Sri Lanka. There is also a shrine to SethuMadhava and Lakshmi in Rameswaram. Sethu Madhava is also referred to as Sweta Madhava, the term Sweta referring to the white stone with which the image is made. The Gandamadana parvatam: is a hill on the island which bears a small shrine containing imprints of Rama's feet held in worship . Architecture and History: This temple, spread over an area of 15 acres , has lofty gopurams, massive walls and a collossal Nandi. 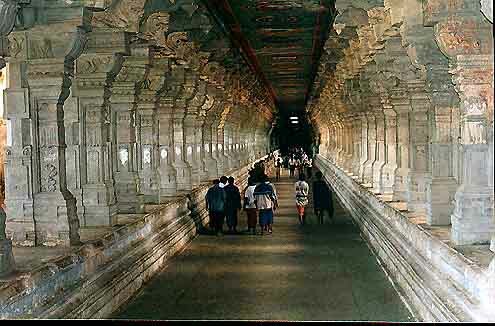 Rameswaram also boasts of a 4000 feet long pillared corridor with over 4000 pillars, supposedly the longest in the world. The carved granite pillars are mounted on a raised platform. 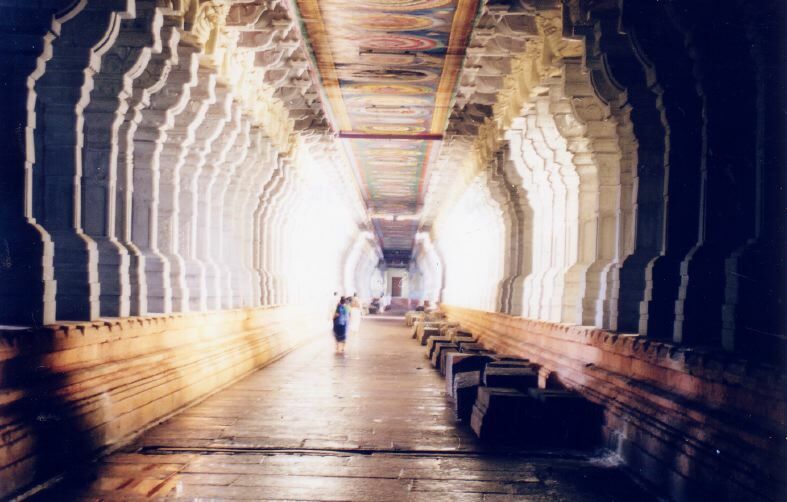 What is unique about this corridor is that the rock is not indigenous to the island and it was brought in from elsewhere in Tamilnadu across the sea. The eastern Rajagopuram towers to a height of 126 feet and it has nine levels. The Western Rajagopuram, though impressive is not as tall as the Eastern one. The stuccoed image of Nandi is about 18 feet tall and 22 feet in length. It is believed that the ancient shrine was housed in a thatched hut until the 12th century and that the 1st ever masonry structure was built by Parakrama Bahu of Sri Lanka. The Setupathy rulers of Ramanathapuram completed the rest of the temple. Some of the temple vimaanams resemble the Vimaanams of the Pallava period. Much of the additions were carried out between the 12th and the 16th centuries. The long corridor (3rd prakaram) dates back only to the 18th century. The Gandhamadhana Parvatam (hill) provides a good view of the temple. This temple has received royal patronage from several kingdoms such as Travancore, Ramanathapuram, Mysore and Pudukkottai. Worship: Six worship services are carried out each day, the first being at 5am. Special worship services are carried out every Friday. Festivals: Rama's worship is commemorated in the month of Aani (June 15-July 15); two annual Bhrammotsavams are celebrated in Aadi and in Maasi. Theertham (Water springs): There are 36 Theerthams in Rameswaram of which 22 are in the temple and these waters are said to possess medicinal properties. Bathing in these is considered to be of great significance. The Agni theertham refers to the ocean while the Koti theertham is located within the temple itself. Other points of interest: The Gandamadana parvatam (hill) provides a commanding view of the island. It also bears a shrine said to bear the footprints of rama. Dhanuskoti (struck by a ravaging cyclone in the 20th century) is the easternmost tip of the island, where legend has it that Rama with the tip of his bow destroyed the bridge that he had built between the island and Srilanka, during his victorious return. There is a Kodandarama temple located on the way between Dhanushkoti and the Ramanatha temple. Tiruppullaani nearby represents the site where Rama sojourned on his way to Lanka. Devipatnam is home to the Navapaashaanam stones installed by Rama. 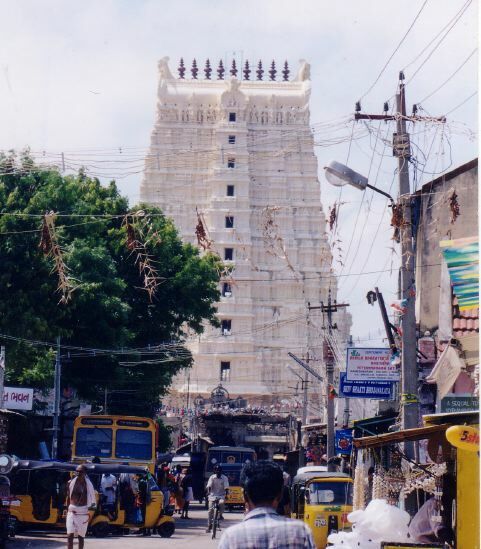 Templenet acknowledges the contribution of the 3 images of the Rameswaram temple above by C. Vedanarayanan, UK.